It was over 40 years ago as a 12 year old boy when my father took me on my first whitetail deer hunt. We camped in the woods with his 4 brothers and many of my cousins. There was a potbelly stove that we cooked our meals on and at times huddled around it to get warm. We would all get up early and go out to our deer hunting blinds before the sun came up. We would each put $5 dollars in the buck pole pot (my dad paid my way) with the winnings to be divided by who got the 1st buck and who got the biggest trophy buck for the week. What a time we had! Every night in deer camp around the fire it was awesome! As I think back about it now, it was a magical time; It was a wonderful time spent with family and friends; Great memories were created and relived again and again. Fast forward to present day. My cousin, Mark, and I are still whitetail deer hunting and enjoying every minute of creating an environment that brings family and friends together over a common interest. The love of the majestic and beautiful whitetail buck, the thrill of the hunt, the fun, laughter, and camaraderie of deer camp. I believe Mark and I have created a deer camp where whitetail deer hunters can enjoy a beautiful environment of woods, rolling hills, plush food plots, running creek, and yes big beautiful majestic whitetail bucks! Our lodge is warm and comfortable with a large dinning and living room area. There are 3 separate bedrooms and 2 bathrooms. The camp fire........ well there is where the stories begin! 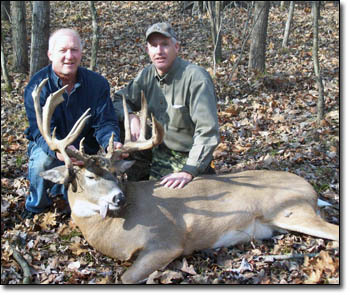 Mark and I have invested in some of the best trophy whitetail deer genetics the country has to offer. 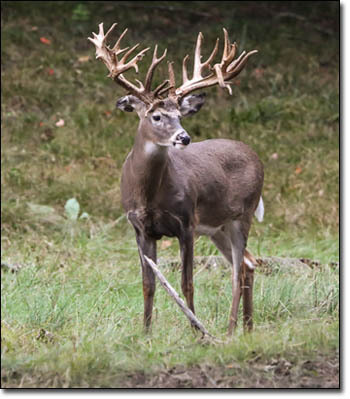 Whether it be 8 to 14 point bucks with a typical rack, or non-typical bucks with drop tines, double beams, and 20+ points, we have a trophy whitetail buck that will surely get you excited! Mark and I would like to personally invite you to deer hunt with us at the Rhino Hunt Club where family and friends make memories for a lifetime! Take a look at this trophy irregular / non-typical buck! 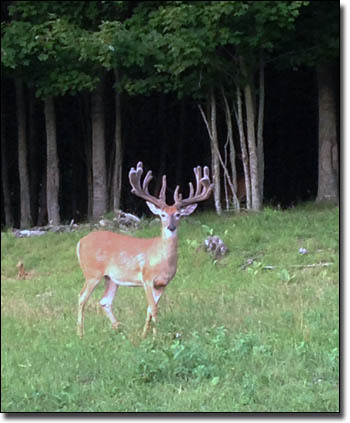 One of our top breeding bucks.